First, all full power US TV transmitters will stop analog broadcasting, switching to digital services. Second, and pay full attention, all stations currently operating in the 700 MHz to 800 MHz frequency band (Channel 52 to Channel 69) have to vacate these frequencies, moving to the 470 to 700 MHz portion of the UHF frequency range, clearing the way for a spectrum auction, generating close to 20 billion dollars in revenues for the US Treasury. Approximately 600 TV stations, out of the 1812 full power UHF stations, will be confronted with a “significant channel movement”, affecting not only their broadcast service areas, but also the over-the-air DTV reception conditions for many-many CATV systems. 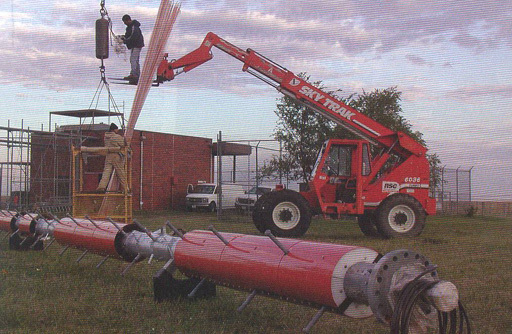 If you think that the installation of the new CATV receiving antennas will represent technical and financial difficulties, take a look on the photograph below, observing the size of the transmitting antenna, to be installed on the top of a 1000 ft high tower. The question is, can important technical work on tower and installation of the new antennas be accomplished on time? No one wants to head doom and gloom stuff, but some stations may not be able to provide DTV service to all of their viewers. Orders for transmitters, waveguides and transmit antennas needed to be expedited, due to less than adequate production capacity. The limited number of qualified tower crews may create a high demand for their services. Because of inclement winter weather conditions in much of the country, installation must be finished before November. Will the new HDTV transmit antenna be delivered to the site before August? Can experienced and reliable tower crews lined up for the August to October antenna instillation window? The qualified tower crews are probably booked for the fourth quarter of 2008. The concept that all US full power stations will be ready by February 17, 2009 to start DTV coverage, is a fiction. If 75% of the stations will be ready and operational in February 2008, that should be considered an optimistic prediction. Are you prepared for the DTV switchover? Do you know the new channel assignments starting February 17, 2009? Use over-the-air reception with the aid of new antennas. Importation of the High Definition TV programming is not free. If the fiber transportation is provided by AT&T, or SPRINT, or any other common carrier, they will charge a monthly fee. In the first approach the dollar figure may not look too high, but if you think in terms of five of ten years, the payments may add up to a five digit figure. It can be eliminated by switching to the over-air-reception alternative. Even if the company decided for the fiber transportation solution, consider reliability. Usually the fiber feed is a single direct line, not the much more expensive ring configuration. That single line in the metro area can be damaged and the repair may take more than five minutes. Wouldn’t it be nice to have a standby antenna, restoring the HDTV services instantly? Repeating: The over-the-air connection has two advantages. Instant switchover in case the fiber connection fails. Theoretically, a station currently operating on Channel 52 to Channel 69 can be moved to any open channel in the 470 to 700 MHz frequency range. In reality, the movement is not exactly free of restrictions. Grandfathered UHF stations must be protected from new co-channel and adjacent channel interference possibilities. Although the coordination work started some time ago, it seems that valuable time was lost, There is a considerable difference between interference predictions and interference verified under actual field conditions. No comprehensive tests and measurements have been conducted so far, no evaluation reports published on the subject. If the above is a pessimistic view of DTV musical chairs, what can be expected for the more then 7,500 operational CATV systems in this country, waiting for the definitive new channel assignments? JULY, 2008 Obtain expert recommendations for the new antenna/antenna-array requirements, as well as an antenna-tower upgrade design. SEPTEMBER, 2008 Sign your contract with the tower crew for tower work. OCTOBER-NOVEMBER, 2008 Upgrade the antenna tower for the February 2009 switchover. DECEMBER, 2008 HDTV field testing under inclement (winter) weather conditions. Record HDTV reception, proving the reliability of signals. It took a while for the other shoe to drop, but as more and more reports arrive from the field, we find that many CATV technicians are concerned about the February 2009 switchover to DTV. Here is a good example what could happen the morning of February 17, 2009. According to published data files, Channel 54, WWBT-DT, Richmond, Va. an NBC affiliate, currently operating a 1000 kW effective radiated power transmitter, must vacate Channel 54, moving the DTV transmitter to Channel 12, their analog VHF broadcast station. Channel 12, WWBT, Richmond is currently operating a 316 kW transmitter. The new Channel 12 DTV station is licensed to 6 kW, repeating 6 kW effective radiated output power, thus representing a 52.7 times lower output or about a 16 dB reduction in output power, using the current Channel 12 transmit antenna. 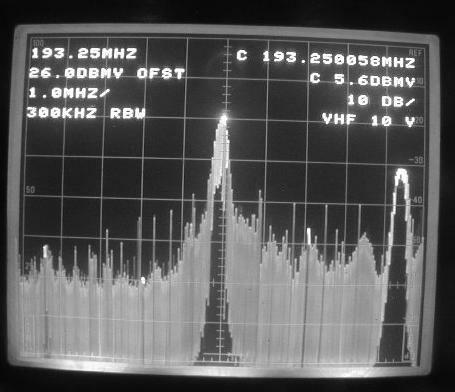 Will the new 5.5 MHz vide, significantly reduced Channel 12 power spectrum ascertain the same service coverage than the Channel 12 analog station provided before? The current Channel 12 analog transmitter has a 60 mile radius service coverage. Question: Will the following systems in CHARLOTTESVILLE (65 miles), NEWPORT NEWS (66 miles) or SOUTH HILL ( 63 miles) still deliver high quality NBC pictures after the output power was reduced to 6 kW? The other shoe will be dropped the morning of February 17, 2009, when the Cable TV subscribers may find pixelation in the NBC pictures, accompanied by missing sound. How will the CATV head-end engineer react? Calling the office of WEBTV-DT in Richmond and ask for an increase in power? The output power was licensed by the FCC and a change requires a long administrative process. Ordering a new quad-array of Channel 12 Yagis and a preamplifier? The new antenna may be delivered six weeks later, the installation takes another four weeks,--if they can find a qualified and fully insured tower crew. CAN DTV COVERAGE LIVE UP TO THE PROMISES? Channel 10, WHTM-DT, Harrisburg, the digital affiliate of Channel 27, Harrisburg operates a 16.2 kW effective radiated power DTV station and a 1021 feet high transmit tower. The receiving test setup, shown on the photograph below, was located at a distance of 48 miles from the station, to check the reception of WHTH-DT, Harrisburg. No Channel 10 DTV spectrum was received at the location. Suspecting a problem with the test- antenna, the antenna was oriented toward Philadelphia. From a distance of 68 miles, a high level (5.6 dBmV) Philadelphia video carrier was received, as displayed on the photograph below, confirming the satisfactory performance of the antenna. Based on the Channel 10, Harrisburg experience, what is to be expected in Charlottesville, Va., where the distance is 65 miles, and the output level is only 6 kW? Can the projected DTV coverage live up to promises, covering the Charlottesville, Va., area? For possible extenuating circumstances watch for the June 2008 edition of the Biro Technical Bulletins.